Best-in-class solutions that save time and money by automating risk assessment, dispute administration, fraud prevention, and treasury management. Save time and money with a simple, full-featured Reg E dispute tracking solution. Perform originator risk assessments quick and easy with automated tracking and reporting of ACH and other payments activity. Prevent fraud with automated ACH positive pay, check positive pay, and account reconciliation. Centrix employees embody our principles on a daily basis. We encourage you to talk with financial institutions that work with us and use our products to confirm the level of service we deliver. 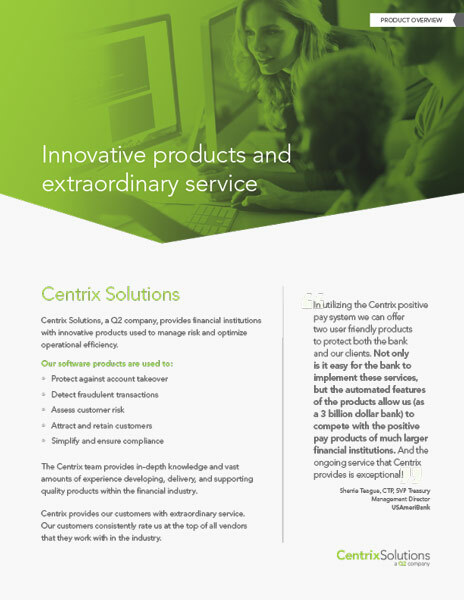 The biggest efficiency for us has been with Centrix, especially positive pay. The fact that it is integrated with reconciliation makes it much easier for our customers to interact and address their needs in a single solution. This has been most beneficial when working with our larger corporate customers.